We will leave San José and drive towards the Central Pacific Coast. On our way there, we will stop for a delicious and traditional Costa Rican breakfast and to observe from a safe distance, the crocodiles at the Tarcoles River. Estimated Departure from San José: Between 6:00 A.M. – 07:00 A.M.
Then, we will continue to the Punta Leona Resort, which is an exuberant beach hotel, awarded with the Environmental Blue Flag. 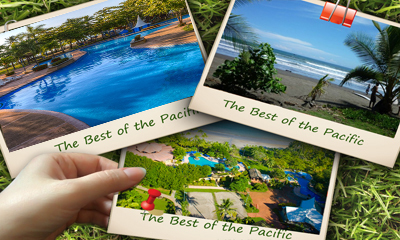 It is surrounded by 750 acres of tropical rainforest and beautiful beaches with shades of white sand washed by the emerald-green water of the Pacific Ocean. You will have plenty of time to enjoy to the beach, swim in the crystal ocean water or just relax at the swimming pool. A minimum of 4 passengers is required for this tour to operate. Your reservation will be placed on hold until the tour meets the minimum number of required passengers. Once this requirement is fulfilled, we will send you a confirmation message. *Available on Monday, Friday, Saturday and Sunday. – Cancellation must be made a full 48 hours prior to the service, otherwise a penalty of 100% will be applied 90% refund if cancel 48 hours or more (10% charged to cover bank refund fees). – No refunds for No shows.